Thank you all for being here, and thank you Ciaran for the nice introduction. Ciaran is the link back to my time in Australia and represents several students who did the hard work which has brought me this recognition. He is one of the best products of this university – having won the Ross Martin Award of the College of Engineering for the best PhD student. He is also co-author with me on 25 papers – a burden he has been trying to live down by branching out and putting some distance between us – I am grateful that in spite of this he agreed to give my citation today. This award is very special to me. This is the first time I am receiving an award that had money come with it. Every time I won an award I would go home and report to my wife, and always the first question would be, how much money are you getting? When I say that there is “no money, just prestige”, she would say “what is the prestige in it if there is no money?” But this one was different: no sooner than I told her that I have been awarded the Siess Chair, money was actually in our bank account – it was her kind of award. This explains why there are four generations of my family here, from my mother-in-law to my brother and my wife’s brother (and their families, including our niece Sarmini and nephew Thivyan), all the way to our grandson Vinay– clearly my wife thinks this is special and deserves to be celebrated. So, I am grateful to the late Professor Chester Siess, Helen Siess and the Siess family for establishing this endowment. Just receiving it makes me special, but giving it must make them super special. I am proud to be a member of the #1 ranked CEE department – although I have benefited enormously by being here, I was always concerned that I have not contributed much to the success of the department. So I am truly grateful to my colleagues in the Civil and Environmental Engineering Department who, in spite of this, have considered me to be worthy of this recognition. I also want to acknowledge the support of the Department of Geography, and the freedom I have had to chart my own course in the university. For me today’s recognition is the culmination of an incredible journey: incredible not because (as I often boast) that I have lived at least 2 years in 5 continents. That may sound exciting and exotic, but it was not like I had a choice in it. What is incredible is that I have made it this far from where I started. I grew up poor in a small village in northern Sri Lanka. My brother Sivam is here from Toronto, and I also invited our friend Dr Skandarajah from Indianapolis, who was a classmate of my brother and brother of my classmate, who can relate to this. We used to live in a house that had no electricity, and no running water. We had an open well, but the water was brackish – so sometimes it was my job to go to neighboring houses to fetch drinking quality water. My uncle bought me a bicycle to ride the 4 miles to high school, because my parents couldn’t afford it. I didn’t even own a pair of shoes until I left for College. A painful memory I have is of the 1969 landing on the moon. Because we did not have a radio at home, I went into town and stood outside a corner tea shop in the hot sun for over 8 hours so I could listen to the live commentary on their radio. In spite of this my parents have a lot to do with my success. I sometimes think that I am like my father inside the home (dutiful, enlightened, but laid back), and like my mother outside the home (strong willed, from who I inherited my fighting spirit). My mother may not have got past eighth grade, but she was intelligent and street-wise. She had phenomenal self-belief and staying power that pulled our family out of the big hole we were in. In spite of enormous difficulties she gave me cover: she begged and borrowed – she would even get into fights that made me cringe so I (and our brothers and sisters) could pursue our dreams – my brother here is living witness. She made sure he went all the way to a PhD in Econometrics in Canada in spite of his disability. While I was in high school, while I studied late at night with the only kerosene lantern we had – my mother would stay up outside until I went to sleep. And she would wake me up at 4.00 o’clock in the morning to study while she went about her chores. I want to remember my mother with an anecdote. This was in 1969: in Sri Lanka to enter the university one has to sit a country-wide competitive exam. To do Engineering one had to specialize in 4 subjects: Pure Mathematics, Applied Mathematics, Physics and Chemistry. I was the first one in my (even extended) family to go to high school, let alone take this exam. In April 1969 the results were announced at school. I have two classmates here from Chicago who took the exam with me: both Sathiaseelan and Padmini are electrical engineers, and he is a professor at Northwestern Medical School. My grades were 1 A and 3 B. You might think this is a rather ordinary result – actually it transpired later that not only was it the best in my school, it was the 8th best in the country out of some 60,000 students who took the exam that year. I rushed home to announce the result: my mother was chatting to a bunch of her friends. I excitedly told her that I got 1 A and 3 B. My mother paused a little, looked at her friends, then turned to me and asked, Son, is that a pass or a fail? To this day I do not know if she really did not understand what 1 A and 3 B meant or if she was putting on an act to let her friends know that I had passed. I suspect that she knew that her friends would not understand fancy letters like A and B, and only pass/fail would get the message across (and get repeated around town) – that is the kind of person she was. Anyway, I went to university and each year we would have our annual examinations, and when the results were announced, I would send a telegram home with a brief message: Exam Pass First Class (Exam Pass was for my mother, First Class was for my father). From Sri Lanka I went to the Asian Institute of Technology (AIT), Thailand on a scholarship for my Master’s degree: my grades were not good enough to go to graduate school in the UK (USA was unknown to us then). After AIT, I tried but failed to land a PhD place, and so I took a consulting engineering job in Nigeria that came my way (actually) by accident. I had a wonderful time there and met scores of Sri Lankan friends. Jeevan Hoole is one of them – he and his wife Dushyanthi are Professors at Michigan State, and agreed to grace this event. I want to recognize someone who I met in Nigeria as a kid, just 5 years then: 35 years later he arrived on this campus as a Professor of Electrical Engineering. I am talking about Professor Kirubaharan, who is in the audience: he used to call me “uncle” then he still calls me “uncle” now. I went to Nigeria, putting off my PhD dreams because my family back home needed my support. Four years later, in 1981, I tried again. This time to maximize my chances I applied to 15 universities: incredibly Princeton was the only one that admitted me. To this day I am not sure how I managed it – my PhD advisor would never let me know – I guess I was just very lucky. After I completed my PhD, I tried for faculty positions in the USA for 2 years. I did not land even a single interview. I was desperate and started to look elsewhere for jobs: because of the civil war in Sri Lanka and being a Tamil going back home was not an option. And then a miracle happened. I was once interviewed for a research scientist position at CSIRO Australia – I knew later I did not get that job either. One night in 1988 I received a surprise phone call from a strange guy by the name of Jorg Imberger from the University of Western Australia. He said to me, I heard that you did not get the job at CSIRO, would you like to come and work for us? I was initially more annoyed than uninterested: I did not know him or Western Australia (it was the furthest place in my imagination), besides it was a 3-year soft money lecturer position. I was also annoyed I had to hear from him about the CSIRO job. But he persisted, I was desperate, so I agreed to go if he could arrange permanent residency for us in Australia. He was true to his word, I took the job and we left for Australia, expecting the worst and hoping for the best. To cut the long story short that was a turning point in my life – and as they say the rest is history. As you can see, there was pain in every move I made, but I also had some lucky breaks. The luckiest break of all was marrying Banumathy, my wife of 34 years. There is an interesting story behind that too. While I was in Nigeria and getting ready for Princeton, I had agreed to an arranged marriage and my parents were seriously searching for a girl for me. But it was going slow, and I was getting impatient. So I wrote to my father, and complained: how can this be so difficult?, why not place a matrimonial advertisement in the newspaper? My father was unimpressed and wrote me a long letter. He said that one advertises only when one has a bad product to sell – reminded me that I am not a bad product. He said that marriage is like a thousand year crop and a lot of experience and wisdom must go into arranging it. He told me, in his words (in English): you don’t have the experience to even have an opinion on this matter. Soon enough the marriage was arranged, and I met my wife for the first time on the day of our wedding (I was 28, she was 18). Two weeks later we were on the plane to New York. Little by little, even as I got immersed in my work, my wife took charge of the family. Nowadays she would complain to anybody who is willing to listen, that she has been a single parent, not only to our two sons, but increasingly to me as well. I want to also acknowledge our sons Kavin and Mayuran, and our daughter-in-law Lizanne, who are here to celebrate with us, along with our lovely grandson, Vinay, our pride and joy. For them I am not an engineer or a professor, just a dad or grand-dad: in fact, they are surprised that someone who cannot do the simple things at home can be an engineer, but they love me regardless. We are a very close-knit family and my wife is the center of our universe. There is a saying in Tamil: “You need a wall to paint a masterpiece”. My wife has been my wall, the backdrop to my success. No amount of thanks will do justice to the sacrifices she has made and the care with which she keeps us together. It is to her that I dedicate this award and every good thing that has happened to me. Sivapalan was fortunate due to having had his early education in English, and thus enabled to enter the realm of knowledge and do well. Many potential ‘Sivapalans’ are ‘stillborn’ in Sri Lanka as all regimes blindly followed the ‘Sinhala only’ policy of SWRDB, due to a false sense of ‘nationalism’. All rich citizens, especially politicians educate their children in english, and the rest are relegated to the fate thrust upon them. I agree with this comment but it is more complicated and needs addressing. Sivapalan by law had to study in the Tamil language till the A Levels. At the university we were switched to English overnight. But this is EXACTLY the same situation today (except for a very few who do the Sri Lankan A Levels in English). Yet, our generation was far better in English than someone doing engineering today. The problem therefore is from before the A Levels. Our teachers? The amount of English one hears outside class? What we read for pleasure? The English syllabus at school — essays and précis then versus filling in the blanks now? I think English is one of the biggest problems facing the new generation and we would ignore it only at our own peril. Now here’s a man who should be admired, not just for reaching great heights, his perseverance and humility, but also for the appreciation and admiration he has for his parents, family and loved ones. Prof. Murugesu Sivapalan, much respect goes out to you Sir! Good to learn about scholars from Sri Lanka who have beaten the odds to become very successful in their academic works. Finally Professor got the award with cash to silence the teasing. Don’t get comfy. She would come up with another topic to keep you grounded and drive you to next level. Very inspirational life story. Thank you for sharing it with us. What a fascinating read of a great success story. Incredibly, it also shows through the personal account the sacrifices made to ensure the emergence of a son on the global scene. It tells of the many other men and women of incredible talent who had to leave Sri Lanka. Others attract such men as the West Australian professor did. Sri Lanka drives them out. Everywhere I go to teach at a university, I am told by the academics there how their Tamil students excel in their work. What a great favour the Sinhalese did us. They are lost in their Mahavamsa mode. The children of the Tamil diaspora now work in French and German and in English in Canada, UK, US and Australia. The pooled experience of these young people will do so much good to Sri Lanka. Will the Sinhalese wake up from their Mahavamsa sleep and ensure that they are attracted back at least for short periods so that they could contribute to their ancestral land? Will the country grant equality to the Tamils which other lands have given them? Will they be able to live in freedom without armies of occupation in their lands? What you say about the Tamil students is true, but we must not overlook the negative. The latest was that the drug dealer executed in Indonesia being described as ‘of Sri Lankan origin’ when he was actually born in England and later became an Australian with his chosen profession. Congratulations, Dr Sivapalan. Your story is true of so many Tamils at that time who had to leave Sri Lanka (their motherland) because of discrimination. Pray God it will never happen again. Thank you for your story that I am sure will inspire many youngsters with talent and find themselves in similar situation as children. You also describe a life that many have experienced and can identify. My first 9 years were similar. It will be good if you can mention the name of your village and the primary and secondary schools you attended. It will give much hope to the school children. Wish you and your family a healthy life for you to contribute in your field for many years to come. Hope some day you will come on sabbatical to join the Engineering Faculty of University of Jaffna (That is still going through birth pains.) in Kilinochchi. As we progress through the years, our debt to our origins inflates to the extent we can never pay back but can invest our time and thoughts in the young as a gift. I hasten to echo the Sentiments of my friend Ethir. Prof.Sivaplan, the Story of your life will be a great Impetus to many of our children at home. …..but not to those children kidnapped by VP with diaspora funding and sent to die. ing hypocrites. believe me , those children and other marveerar are more inspirational to the children in the NE…their sacrfice will not be wasted. Nor to those innocent youth who lost their life and limbs to the brutal JVP and Armed forces. Quite right Native, but SJ was writing about Tamil children wasn’t he? For moment, forget Father S.J.Emmanuel. If you are so concerned about those Tamil kids, what is your contribution to the betterment of their life? Evasion. My contribution is not the issue. You should become a politician. Why haven’t you become one? Some people rejoice at the success of others and thank God as it makes the world a better place while others are just jealous and strive on the misery of others. Taraki belongs to the latter, you can feel pity on him nothing else. Thank you for your pity Burt. I see that pointing out SJ’s hypocrisy is a waste of time. Native turns in into ‘what have you done for the children’ and you think I am criticizing Prof Sivapalan’s success. Nice to read a good news story for the Tamils, for a change. God Bless the Couple and the Family Unit. Truly inspirational story. I read this as well as the other two related articles. Simple origins, committed parents, hard work, lucky breaks, strong family unit, ability to identify a few important problems to solve, genuine care for the subordinates, proud to identify with all aspects of the past and the path followed, giving such public recognition and credit to the partner, simpleness and humility,……the list can go on and on. Our youngsters in Sri Lanka should know this story as well as stories about people like him. Professor Sivapalan, your story is very inspirational, you are a real gentleman and a scholar. Wish you and your family well. Prof:Sivapalan has his feet very much on the ground,in spite of reaching Dizzy heights.From Nadir to Zenith! The secret,I believe is his humility. Talking about Languages,in the old days at Peradeniya,classification was as follows. The above is an insight to the stupid Language policy we have had. Great stuff, Siva. They say that there is a great woman behind every succesful man. Many of us could relate with your story with respect to your family set up, inspirational teachers, unexpected guidance, missed opportunities, fortunate links, etc. It is really touchy to see a raw brainy kid from rural Sri Lanka reaching great heights and polietly appreciating his contributors. We all knew that it was a great loss to Australian students when you moved to US. This is only another milestone, and I am sure there are more to come. Seriously though… one wonders why someone would thump down this kind of comments! 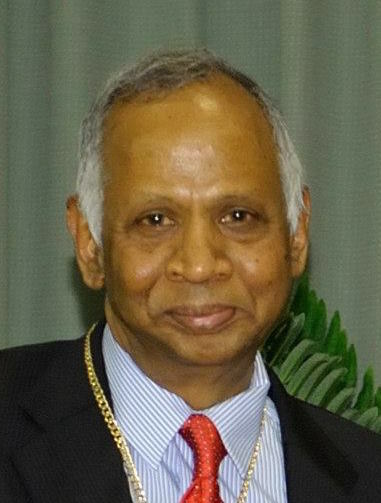 I have known about Dr. Sivapalan’s professorship for a long time but didn’t know where he is from and his high school until I read about it on CT. It is always good to hear about SL Tamil achievements, particularly from my own Vadamaradchi region. Just as Dr. Sivapalan speaks about how his wife supported him,I remember how the wives of two great Indian Tamil scientists–Subramaniam Chandrasekhar, Nobel Laureate, and Srinivasa Varadhan, the renowned Mathematician at NYU and winner of Nobel-equivalent prizes–spoke about carrying all the burden while their husbands spent pretty much all their time on work. That raises an interesting question: should Tamils encourage such old-fashioned sacrifice from their womenfolk, or should they try to balance the quest for achievement with modernity, where women should be encouraged to have productive and happy pursuits of their own? I am firmly in the latter camp. Moreover, are such recognitions all there is to life? For instance,looking at life itself with originality, and reflecting on questions of reason vs. faith, the need to raise one’s voice against injustices rather than remaining aloof in an ivory tower, etc., also seem important. In my mind, a true scientist cannot really be a believer in any religion. Kudos to Sivapalan, way to go sir ! “In my mind, a true scientist cannot really be a believer in any religion. “, just religion only or any belief. If so you are in big trouble mate. This story is typical of several families from Jaffna. Parents knew education is the only way they can uplift the family. I have known single mothers/widows who toiled hard to educate their children and the children attaining great heights. I hope the average Sinhalese who always says that the British favoured the Tamils will come to realise the truth. Sinhalese government put several obstacles against the hard working Tamils. But thanks to the will power of the parents, students and at times extended families who helped the promising youngsters achieve their dreams. Thanks should go to countries like, Malaysia, Singapore, Nigeria, Ghana, South Africa. Brunei etc. which employed the hard working Tamils and played a major role in sustaining the dreams and aspirations of the Tamils. Congratulations sir. You are a true inspiration to many who come from disadvantaged back grounds.There would have been many like you in the Tamil community who may have missed out due to the standardization programe that was carried out by the SL governments. There are many cases in the sinhala community too who were disadvantaged due to Banda’s sinhala only policy. Your hardwork,dedication combined with your simple life has paid off very well. I understand that the Current Chief justice Mr Sripavan is another person with very humble beginnings. 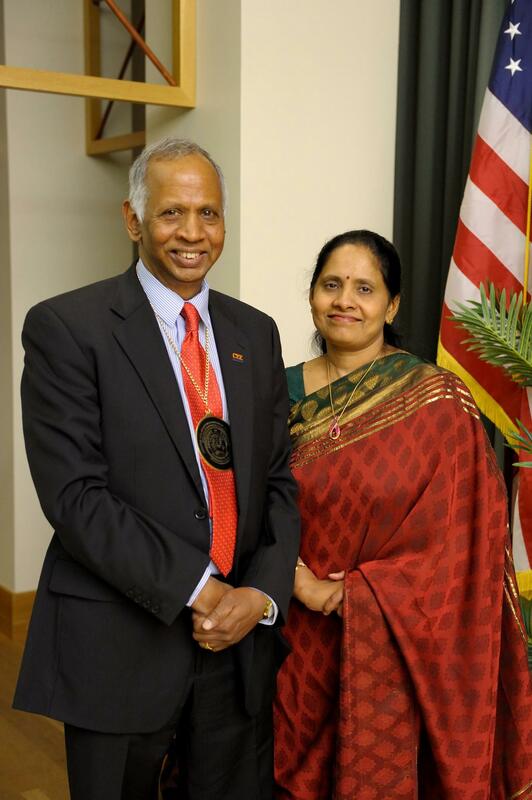 Congratulations, Prof. Sivapalan. Your achievement is remarkable given the circuitous route taken to reach the final recognition. When you completed A’Levels in Sri Lanka, I did my O’Levels in 1975. So we are a few years apart in age. 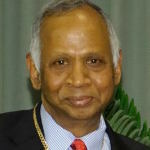 Prof. Sivapalan in your address there is not even one word said about Sri Lankan, Sinhalese people. Wasn’t there even a menial person who treated you well? After all, a majority of your lectures at the University in Sri Lanka would have been Sinhalese. Did they single you out and gave you low marks? Wasn’t there even one lecturer to whom you could say Thank You! Were your contemporaries, who achieved great heights, only Sri Lankan Tamils? What about peers among Sinhalese, Muslims/Malays and Burghers? Why cannot you give credit to Sri Lankan Sinhalese who would have taught you at University in Sri Lanka? I hope you do not discriminate Sri Lankan Sinhalese students who are taking lectures from you at University of Illinois? I hope you do not only favour Tamils and Americans. I still remember Mr. Nallanthuvan who taught me CIMA Accountancy; Mr Sivakumaran who taught me Costing and Mr. Benedict who taught me Business Law and finally late Mr. Joe Perera of St. Joseph’s College who taught me Economics. I fondly remember them and silently thank them for their commitment to students irrespective of their race or creed. Next time, Prof. Sivapalan, you must remember at least one Sinhalese or a non-Tamil. Otherwise, in my view, you are no better than an ordinary Sinhalese, your people call as racist.